This pedal's weakest link is its clean sounds, but if you're bored with straight OD/distortion, its harsh clipping could be for you. Much like vintage fuzz pedals, there's no tone control on this stompbox. This true-bypass pedal is hand-built and painted in the UK by Dean Ramsay. Fuzz is the oft-overlooked member of the 'drive family. It's a shame, because from the early days of '60s psychedelia, to '90s grunge and modern-day fuzz fans like Arctic Monkeys and Queens Of The Stone Age, the humble fuzz box has retained enough character to warrant its place in your pedalboard. 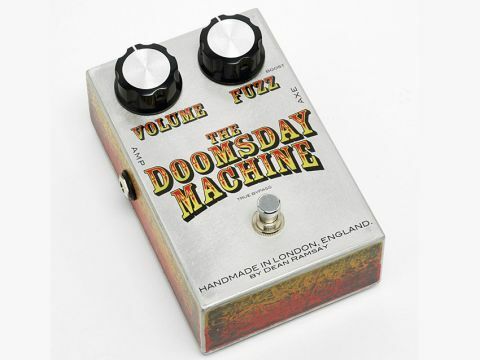 Londoner Dean Ramsay obviously agrees; The Doomsday Machine is one of three analogue fuzz pedals in his current line-up. This pedal has two controls, Volume and Fuzz, and a 'boost' function that doubles the amount of gain on tap, and is activated when the Fuzz control reaches its upper limits (sounds hairy!). We tested The Doomsday machine through a clean valve amp, and with the Fuzz set just above the halfway mark it produces a thick vintage-sounding tone that still maintains some attack. Backing off the gain does clean up the sound, but it also becomes brittle. Our favourite sound came from pushing the pedal to full. With the boost enabled, you get a huge woolly fuzz tone that will send even the most hardened stoner-rock fan into a coma. Because there's no tonal control, you'll need to use your amp's EQ section if you want to tidy up the frequencies.